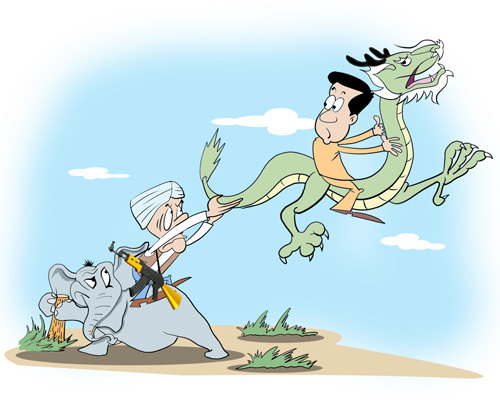 India stepped up its diplomatic and military moves to counter China in 2010 as the "China Threat Theory" gained ground in Indian leading circles. Defense Minister A. K. Antony told army commanders on September 13 that "China's increasing assertiveness" is a "serious threat." Prime Minister Manmohan Singh recently urged the armed forces to strengthen India's border with a "sense of urgency". Indian officials are alarmed by the modernization of China's armed forces. In addition to the Defense Minister's warnings of Chinese "aggression", India's defense chiefs of staff recently qualified China as a "long-term threat" comparable to Pakistan. But the fear of China reflects a lack of understanding of the PLA's strategic intentions. One of the reasons is that contact between the armed forces of the two countries remains limited. At present, the military attaché of the Indian Embassy in Beijing is the only way for India to keep in contact with the Chinese military. The Indian political system accords little decision-making power to the Defense Ministry and communication between the two militaries is limited to specific issues like military exercises and avoiding border conflict. India is stepping up its diplomatic act in East Asia in an effort to counterbalance China's strategic power. The "Look East" Policy initiated by former Indian Prime Minister Narasimha Rao has evolved into a more solid military partnership with its Asian partners. In the past three months, Indian military officials have visited Vietnam, Korea, Japan, the Philippines, Indonesia, Thailand and Singapore. In July, Indian Army Chief V. K. Singh visited Vietnam, the first visit by an Indian military leader for nearly 10 years. In mid-October, Defense Minister A. K. Antony visited Vietnam to attend an ASEAN meeting. Over the past 10 years, India has helped Vietnam strengthen its sea and air military capabilities supposedly in order to prevent China from fully "controlling the South China Sea." In September, Antony became the first Indian Defense Minister to visit South Korea. Compared to the, perhaps understandable, India-Vietnam defense cooperation, the developing India-South Korea partnership seems more explicitly aimed at counterbalancing China. India is also actively strengthening defense cooperation with Japan. On September 28, Air Force Chief P. V. Naik participated in the first military dialogue between India and Japan. Prime Minister Manmohan Singh is scheduled to visit Japan in late October. An Indian fleet will shortly complete a one-month trip in the Pacific Ocean, during which it will have visited Australia, Indonesia, Singapore and Vietnam. India's military and political leaders see their counterbalancing measures and support for China's neighbors as a long-term strategy.